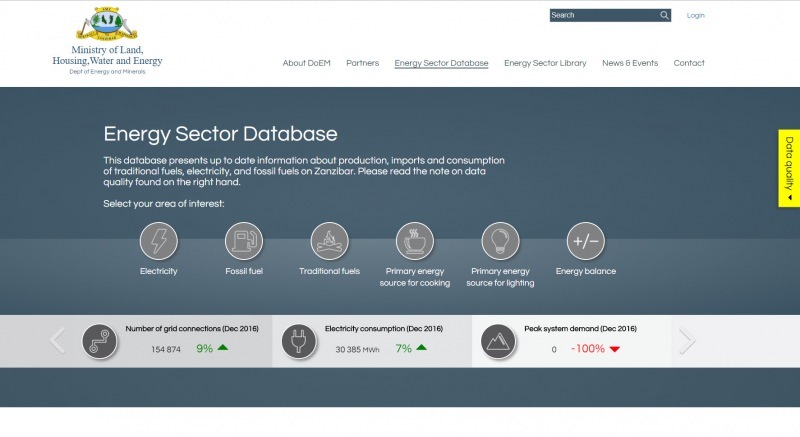 This governmental database provides actual and historical information about the production, imports/exports and consumption of traditional fuels, electricity, and fossil fuels on Zanzibar. Interactive charts enables the viewer to select relevant time period(s), physical locations + subtypes and download relevant data for external use. Personnel (placed in the ministry + externally on the islands) can feed data to the database from various locations and the platform is prepared for automatisation of data import. The database is integrated into a website for the Department of Energy and Minerals (DoEM), which is organised under the Ministry of Land, Housing, Water and Energy (MLHWE). Annual summary/overview reports are automatically generated and published in the library section, where other relevant informations is also available for download. The website also includes news and information about the eneergy programs and related activities in Zanzibar.